Stewart Johnson of Kendric Vineyards had extended an invitation via Facebook in late December to come by his winery on Treasure Island in San Francisco Bay for an informal tasting. He mentioned that he would have a few bottles open, and he wanted to taste through some barrels before he added SO2, which he planned to do shortly afterwards. He had some individual lots of his 2013 Pinot Noir that he’d barreled separately – different clones, different fermentation techniques, etc. “It could be fun,” he added – that was all I needed to hear! I visited Stewart at his Marin County vineyard a few years ago (link to 2010 visit) and I’d checked out his winery space on Treasure Island in early 2012 when he was in the process of moving in, but this was the first time I’d been there since then. He had his first crush there in 2013, after using several custom crush facilities to process his fruit over the years. I’d first met Stewart in 2009 at the Marin County Wine Celebration, which showcases wines made from fruit grown in the county’s vineyards. I was impressed with his wines and I’ve made sure to taste them at various events since then. 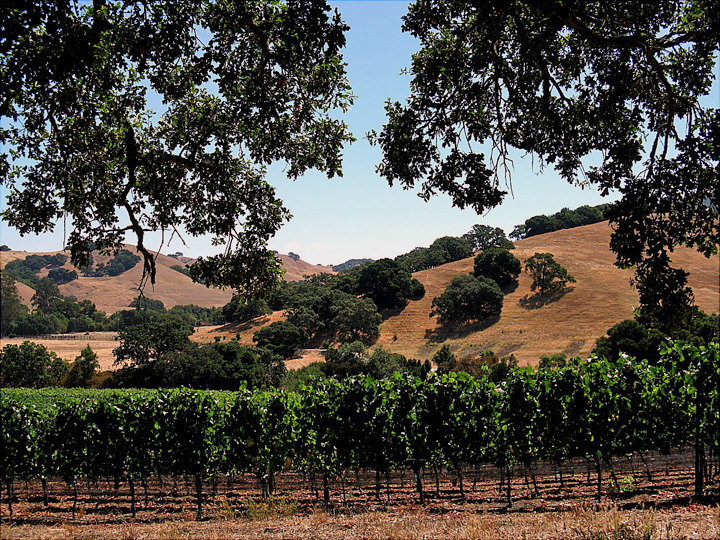 There are not a lot of commercial vineyards in Marin County – much of the soil in the region is not well-suited for viticulture, and the climate is chilly enough that it can be marginal to ripen even Pinot Noir on a regular basis. Kendric Vineyards is in a spot that’s somewhat protected from the cold Pacific winds, just south of the Marin-Sonoma border to the west of Novato and Petaluma. Stewart planted the 8½-acre vineyard in 2002 – both the vineyard and winery are named in tribute to his late father. The vineyard is on an eastward-facing slope, and is planted to seven clones of Pinot Noir plus a small block of Viognier. The Kendric Vineyard Pinot fruit is generally split between Stewart’s own label and a few other producers (currently Flowers and Bailiwick), although in the particularly cold 2011 vintage Stewart ended up selling all of the small amount of fruit he harvested that year. In the past couple of years, Stewart has made a little Viognier from the vineyard too. Kendric 2013 Pinot Noir, Marin County (barrel sample). About 67% whole-cluster fermentation. Medium-light ruby color, featuring bright raspberry and plum fruit and plenty of spice. Good structure, with a moderately grippy tannic finish. Kendric 2013 Pinot Noir, Marin County (barrel sample). Pommard clone, entirely destemmed. Slightly lighter color, with more upfront red fruit along with a slight floral note. Somewhat thinner on the palate than the previous wine, and not as structured. Kendric 2013 Pinot Noir, Marin County (barrel sample). Pommard clone, native yeast fermentation, about 67% whole-cluster. Medium-light color, with a bigger floral component, plus tea leaf, spice and raspberry fruit. More texture on the palate than the previous wine, with chalky tannins on the finish, nice. Kendric 2013 Pinot Noir, Marin County (barrel sample). Pommard clone, fermented on Viognier skins. Medium-light color with a more pronounced floral scent, stone fruit, and spice. Somewhat richer mouthfeel, with less noticeable tannins, quite intriguing. Kendric 2013 Pinot Noir, Marin County (barrel sample). Reserve lot, from new Cadus puncheon. Medium-light color, showing a lot of vanilla/oak at this stage, along with plummy fruit and a bigger structure than the previous samples. This will take longer to develop. Kendric 2013 Sangiovese, Reward Ranch, Shenandoah Valley (barrel sample). Medium color, this displayed plum and earth on the nose, plus some mint/eucalyptus notes and a touch of pepper. Nice acidity with fairly big but not aggressive tannins. Kendric 2013 Sangiovese, Reward Ranch, Shenandoah Valley (barrel sample). Fermented on Viognier skins. Medium color, more fruit-forward cherry and plum than the previous wine, with slight floral notes along with earth and herb aromas. A bit bigger bodied but with less grippy tannins. Kendric 2012 Pinot Noir, Marin County (barrel sample). About 67% whole-cluster fermentation. Medium-light ruby color, this featured bright red fruits and lots of spice, with touches of earth, flowers, and undertones of tea leaf and vanilla/oak. Medium-bodied, this had good acidity and moderate tannins on the finish. Tasty now but it should improve with time in the bottle. Kendric 2012 Pinot Noir, “Reserve,” Marin County (barrel sample). 50% new oak. Medium-light color, showing red cherry, spice, black pepper, and a nicely-integrated sweet oak element. Bigger mouthfeel than the previous wine, with grippier, chalky tannins. Another wine that shows potential but will need more time to develop. Kendric 2013 Viognier, Marin County (keg sample). Light straw color, with pretty aromatics of stone fruit and tropical fruit, flowers, and a stony mineral note. Medium-bodied with a pleasant texture and long finish – showing very well already. Kendric 2013 Viognier, Marin County (keg sample). Kept on skins for about 18 hours. Slightly cloudy light straw color, the fruit and floral aromas on this were toned down from the previous sample, with a significant spice component added. More weight on the palate, this had a bit shorter finish. Kendric 2013 Viognier, Marin County (keg sample). About 50% each from fruit pressed right away and pressed after 18-hour skin contact. Similar light straw color, this retained most of the first sample’s aromatics but with less tropical fruit notes and more stone fruit and pear, along with a touch of the second sample’s spice. Nice texture and finish, an interesting blend of the two styles. Kendric 2010 Pinot Noir, Marin County. About 67% whole-cluster fermentation. Medium-light ruby color – maybe a touch lighter than the barrel samples – displaying bright cranberry and strawberry fruit, earth, and tea leaf, plus a touch of sweet oak in the background. Medium-light bodied, with well-balanced acidity and noticeable but refined tannins, nice. Kendric 2009 Pinot Noir, Marin County. About 67% whole-cluster fermentation. Slightly lighter color, this showed more earth and spice character upfront, along with red fruits and a more pronounced vanilla/oak component. More weight on the palate than the 2010, with a grippier tannic finish that could still use more time to smooth out. Kendric 2008 Pinot Noir, Marin County. About 75% whole-cluster fermentation. Fairly light color, featuring more spice and savory elements upfront, plus cherry and strawberry fruit and a touch of forest floor. Medium-bodied with a lively mouthfeel and finish, showing nicely right now. Kendric 2007 Syrah, Shenandoah Valley. 877 clone, entirely destemmed. Medium-dark purple, with dark berry fruit, spice, earth, a dash of black pepper, and a stony element. Medium-full bodied with a fairly smooth texture and moderate tannins. Stewart’s own background is in law (and his wife Eileen runs a legal practice), but he had past vineyard experience too. His family owns a vineyard in Amador County’s Shenandoah Valley – Reward Ranch – that he helped plant with Sangiovese in 1994 and with Syrah in 2001. 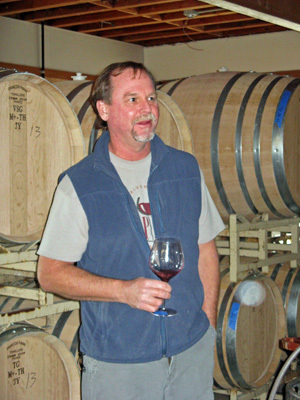 Stewart and his mother Kathleen manage the Reward Ranch vineyard, and the Sangiovese fruit has gone to nearby Vino Noceto Winery, which has produced a vineyard-designated bottling from it. Stewart has made Kendric Syrah from there, and he’s now getting some of the Sangiovese for his own label as well. 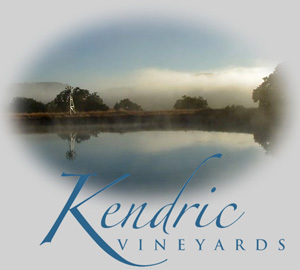 Kendric’s first commercial release was Pinot Noir from the 2004 vintage, and production is small but growing, with about 1,200 cases to be produced from 2013. Stewart’s new facility on Treasure Island isn’t the most obvious space for a winery – formerly part of a school, the ceilings aren’t particularly high and there are lots of windows – but after some simple modifications, he’s made it work surprisingly well. There’s no tasting room as yet, but Stewart said he’s hoping to get one operating there in the future. There are a number of wineries on the island, including a few that offer tastings, and a Kendric tasting room would be a welcome addition there. There was a group of about 8-10 people at the winery when I arrived in the late morning. Most of them had already started out tasting some Viognier samples, but Stewart went back to those again later for those of us who had missed them. Stewart handed me a glass, and we all dove into the heart of the day’s tasting – a variety of 2013 Pinot Noir samples showing different approaches to the fermentation and barrel-aging. Stewart told us that there were three picks from his vineyard in 2013, all around mid-September. Stewart uses Pommard, 115, and 37 (Mount Eden) Pinot clones in the Kendric wines, though most of the barrels we sampled were entirely from Pommard clone. The 37 and 115 clones were fermented in larger vessels, while the Pommard – picked about a week later – went into smaller ones, allowing for more “experiments” in the small lots. Some were fermented with native yeast (Stewart adds Assmannhausen yeast on other lots after allowing the native yeast to start fermentation), while some were entirely destemmed and others entirely whole-cluster fermented. Stewart even did a trial with one small lot that was fermented on about 4 inches of Viognier skins. We also tasted a reserve 2013 Pinot lot, from a new Cadus puncheon. This will get longer barrel-aging (2+ years vs. about 16 months for the typical Kendric Pinots), though it could be blended back into the regular bottling if Stewart doesn’t think it merits a separate reserve bottling. The fruit for the reserve lot came from the part of the vineyard with the shallowest soil, and it was fermented with native yeast. In general Stewart prefers warmer fermentations – ideally lower 90s – to bring out spice and earth components in the wines, though he keeps some lots with cooler ferments to highlight the fruit. Similarly, he likes longer maceration times but will also press some lots earlier for to preserve fruit-forward components for the overall blend. Use of whole-cluster fermentation is another method Stewart has been using to add complexity to his Pinots – the past few vintages have been between 50-70% whole-cluster. Pinots are typically aged in around 40% new oak, and favorite coopers include Cadus and François Frères. We moved on to a couple of 2013 Sangiovese barrel samples, from Reward Ranch fruit. Like one of the Pinots we’d tried, Stewart experimented with one of the Sangiovese lots by fermenting the fruit on Viognier skins. All of the Sangiovese was fermented with native yeast. It was back to Pinot from there, tasting a final 2012 Pinot Noir blend plus a 2012 Reserve Pinot. The regular 2012 Pinot will be bottled soon, while the Reserve – Kendric’s first Reserve Pinot – will get a few more months of barrel aging. Stewart blended our sample of the Reserve Pinot from its two barrels, one of which is a new one. We finished our tasting of upcoming wines with some samples of 2013 Viognier. This will be just the second vintage of Kendric Viognier – as far as I know the 2012 was the first Viognier ever released from Marin. The fruit came from a small part of the vineyard grafted to Viognier in 2011. Stewart expects to release about 100 cases of the 2013. This is definitely cool-climate Viognier, far from the big, blowsy versions that are far too common in California. We first tasted the main lot of Viognier that was pressed immediately, and went on to try a couple of smaller trial lots that were entirely or partially kept on the skins for about 18 hours before pressing. Stewart told us that he wants to make sure he retains the “classic” Viognier aromatics in the finished wine but wants to see what the skin contact can add to it. It certainly changed the character of the wine, and I thought that some percentage of the skin-contact juice in the wine will enhance it. I finished up by tasting a few bottled wines that Stewart had set on a barrel for us to try. I went through the three most recent Pinot releases plus a Syrah. This was a particularly interesting tasting, being able to try a number of individual components that will ultimately be put together in these wines’ final blends. They’ll all bring something different to the wines, and add to their complexity. Stewart mentioned that he’s not opposed to doing a separate bottling for some of the individual lots if they remain distinctive through the barrel-aging process and if their absence from the overall blend would not be detrimental. The 2013 Pinot Noir fermented with native yeast was the one separate lot wine that most people at the tasting (myself included) thought stood out the most at this point, and it might be a candidate for a separate bottling. But as Stewart pointed out, it’s been his experience that the distinctions between lots fermented with native vs. cultured yeast tend to diminish over time, so they may well not be as pronounced in another year as they were in December. I also liked the 2013 Viognier sample that included 50% fruit that had 18 hours of skin contact prior to pressing. Perhaps 50% skin-contact juice may be too much for the final blend, but I liked what it did for the wine. Of the bottled wines, I liked all three of the Pinots – the 2008 has been a favorite but both the 2009 and 2010, while still showing quite young, have a lot of potential given more time in the cellar. Both of those vintages are currently available for purchase from Kendric. It’s great that Stewart is experimenting with so many small lots, and it was fun to be able to taste through some of them at this early stage in their development. It will be interesting to find out how these different lots develop in the barrel, as well as to see what new trials Stewart might have in store for this year’s crush. Kendric remains a winery that flies under the radar, but it’s worthy of wider recognition.